Mike Giant kills it and we’re amped he’s coming down to Hollywood! Giant used to create graphics full time for Think Skateboards in San Francisco. Now he’s rocking REBEL8, his own streetwear company (with his partner Joshy D.) that reflects his deep roots in skateboard, graffiti, and tattoo cultures. 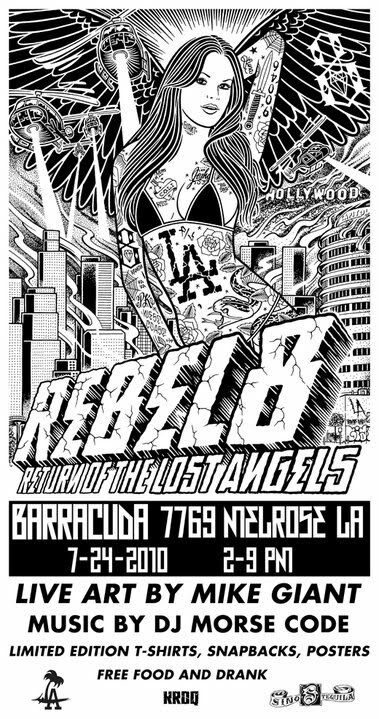 Rebel 8 party at Barracuda on Melrose in Hollywood on 24th July from 2:00pm – 9:00pm. Mike Giant will be painting live and signing at the store. Limited R8LA edition gear will be available. DJ Morse Code spinning. Plus FREE Tsing Tao and FREE tequila and margaritas!